On a clear night with the naked eye, we see what we believe to be stars scattered in every direction across the sky. With binoculars or a small telescope, we can see some of these "stars" are not actually stars at all but star forming regions. 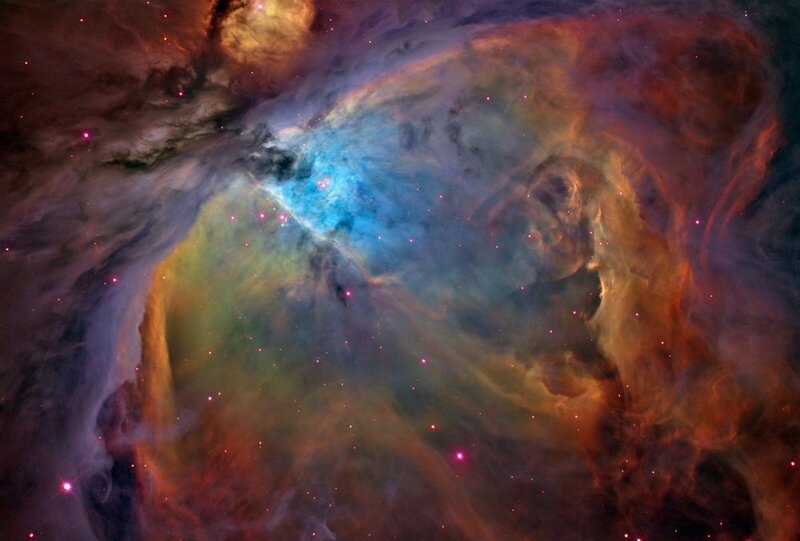 The prettiest of these is also our nearest, the Orion Nebula. At a distance of 1500 light years away we can observe the formation of stars within this massive cloud. A nebula is a huge collection of insterstellar gas, dust hydrogen and helium. Within the nebula the gases collapse together to form the stars. The Orion Nebula is visible to the naked eye in the constellation Orion. Pretty much everyone can identify Orion's Belt in the night sky as a diagonal trio of bright stars. Below these are three vertical dots called the Sword of Orion. The Nebula is the one in the middle. The Nebula is 24 light years across and has a distinct red, violet and green colouration. The Nebula was known in ancient times as far back as the Mayans and may be described within The Three Hearthstones Creation story. The other two being the stars Rigel and Saiph. It has been drawn and photographed now for centuries and is probably one of the most scrutinised objects in the night sky. For anyone disinterested in the cosmos, the Orion Nebula always achieves a "WOW" reaction when shown it through a telescope or binoculars. At the centre of the Nebula is the Trapezium cluster. Four stars discovered by Galileo in the early 1600s. Since then with more powerful telescopes, binary stars have been observed inside the cluster and a 2012 paper suggests the presence of a black hole inside the cluster. It would certainly explain the high velocity dispersion between the stars themselves. The Orion Nebula is very near the end of its life in cosmic terms. Most believe it has around 100,000 years left before the gas and dust is ejected and the young star cluster is left to shine. So I urge everyone, even with a pair of binoculars go and find the Orion Nebula. We only have 100,000 years left to admire it.